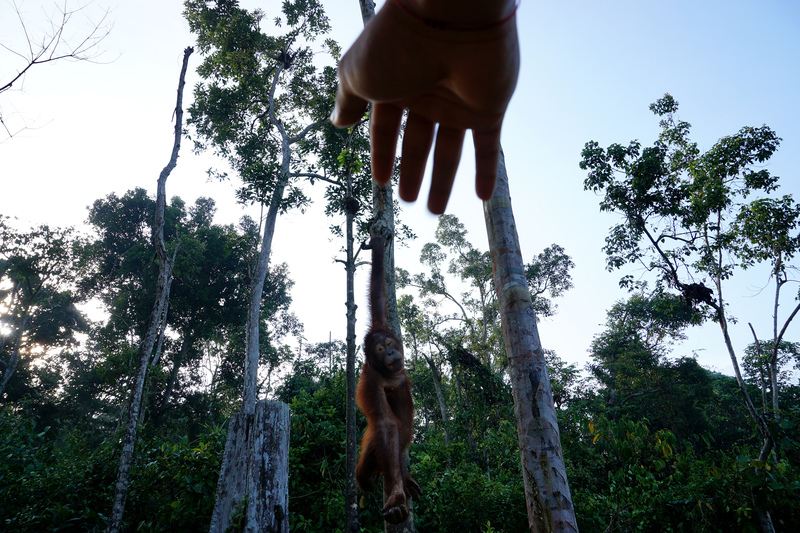 Life in the Orangutan Conservation Center in East Kalimantan, Indonesia. The iconic orangutan prints on the green 500 rupiah bills in Indonesia are forever etched in my memory. During my childhood, we used the bills to joke with friends, comparing them with the picture of the primate. It was only later that I came to see the great apes as something more — symbols of the urgent need to preserve both the orangutan species and the forests where they live; natural shelters of biodiversity. 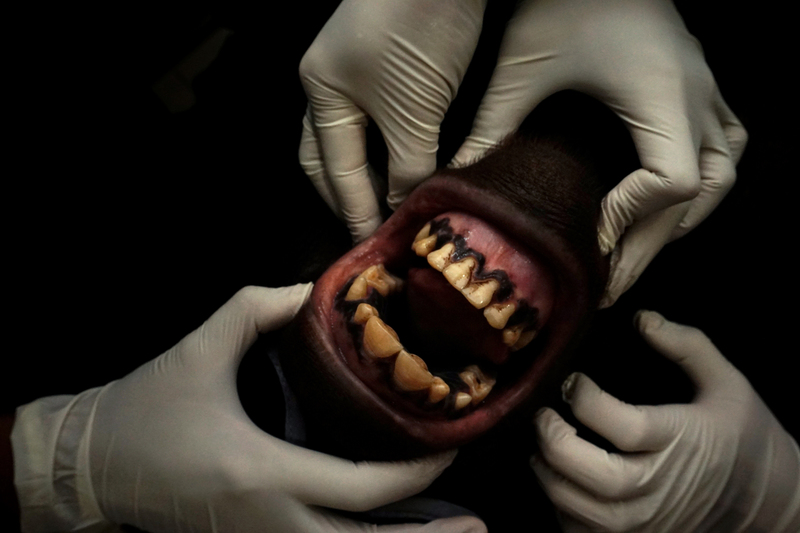 This photo essay aims to display daily life inside the Orangutan Conservation Center. 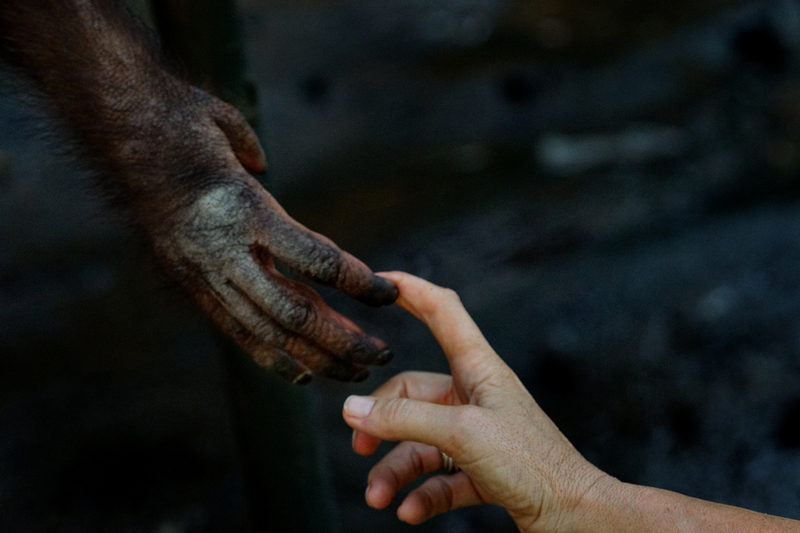 Here, the relationship between orangutans and the keepers varies. At times, it is much akin to surrogacy; at other times, it is more like the bond between sheep and shepherds. Consisting mostly of young enthusiasts, the keepers venture deep into the forest every day. This is the “forest school,” where they prepare the big bipedal red-furred primates for their release into a natural habitat. The keepers follow the orangutans, monitoring and checking on them. The keepers know full well that this job is not risk-free. Dealing with orangutans being prepared for the wildlife requires alertness and knowledge. What they do is both an adventure and a rare life experience. Orangutans are not only intelligent, but also acutely observant. According to evolutionary anthropology expert Raffaella Commitante, humans and orangutans share many similarities — including 96.4 percent of their DNA. Among the many resemblances, Commitante highlights how humans and orangutans think and process information similarly. This once mighty ape is known to have traveled across south China and Java Island during the Pleistocene era, approximately 10.000 years ago. But now, the species lies on the brink of extinction. These melancholy-looking animals are treated as pests and nuisances by plantation companies. Corporations consider them to be trespassers and fruit thieves. To make things worse, orangutans are hunted for their skulls and organs, which can be sold on the black market for a high price. 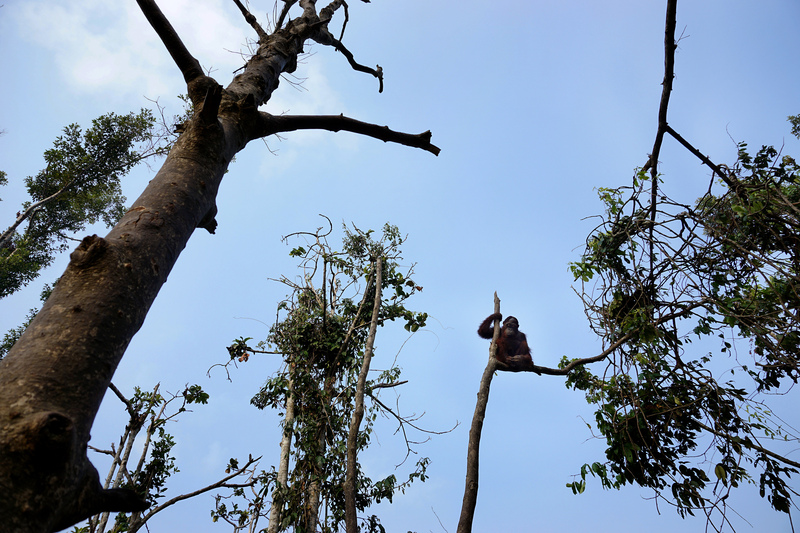 The Dayak Wehea tribe in East Kalimantan believes orangutans to be the incarnation of man. 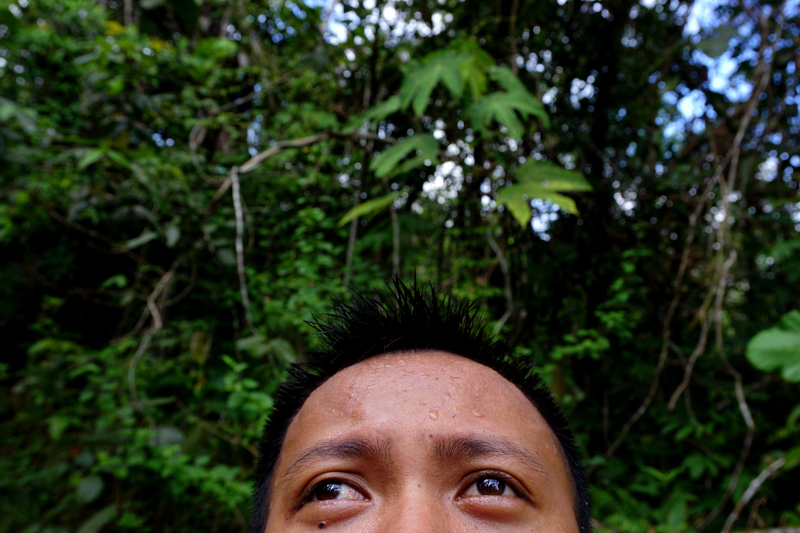 To kill or, even worse, to prey on orangutans will result in curses and catastrophes. With the species teetering on the edge of extinction, it is time for us to decide if we are willing to act to prevent that curse from falling on our collective heads. Adzwari Ridzki is a photographer from Indonesia, currently working at an international NGO focused on animal welfare. 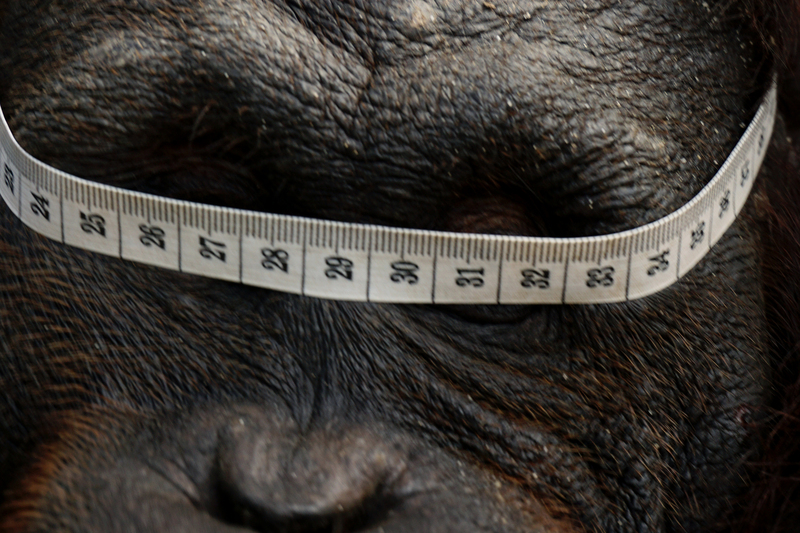 Orangutans share 96.4 percent of humans’ DNA. 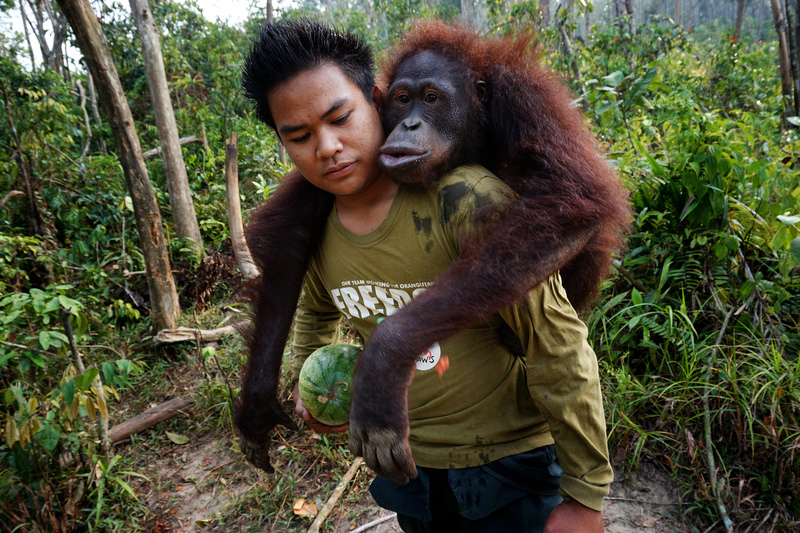 Mardiyanto, 23, carrying an orphaned orangutan to the forest school. General check-ups for orangutans are performed periodically at the rehabilitation center to measure the primates' health and growth. The orangutan keepers also receive general health check-ups to protect them from zoonoses, diseases that can be passed from wildlife to humans. Norfaniansyah, 21, does strength-building in a gym. The keepers know that most orangutans will not dare to pick a fight against a human who looks bigger and stronger than they are. 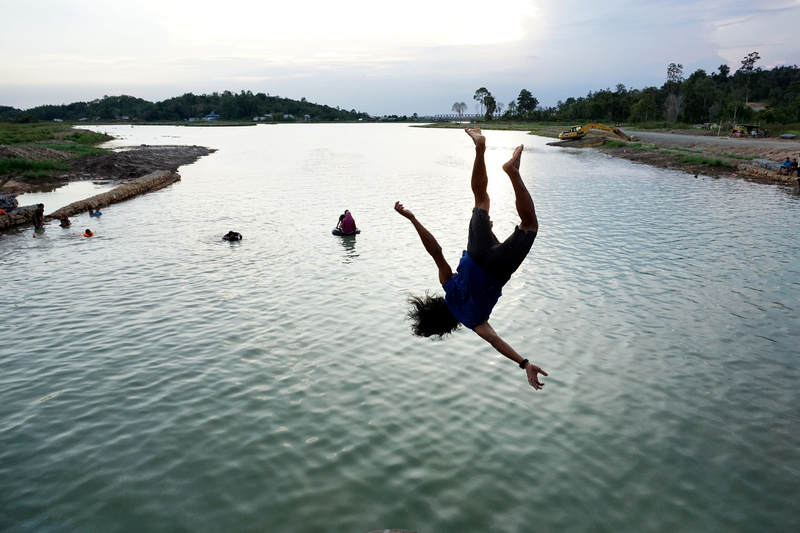 A keeper happily dives into a river. Swimming is one of the keepers' favorite recreational activities. The medical team tries to find out an orangutan's age by checking its teeth. 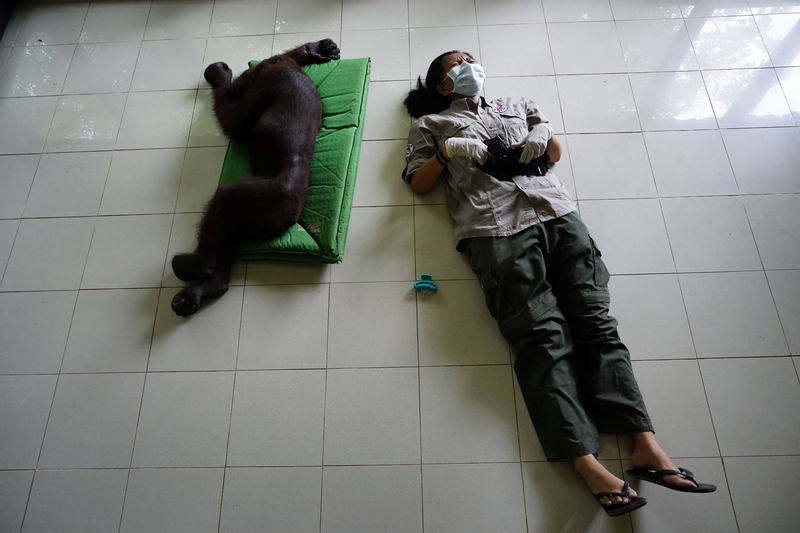 Senior veterinarian, Citrakasih Nente, is still suffering from a back injury caused by an orangutan attack in the past. A young male orangutan in the forest school in East Kalimantan..
Donna Saputra, 25, is monitoring an orangutan in the forest school. Sometimes, the keepers need to work before the orangutans wake up in the morning and after they fall asleep in the evening. 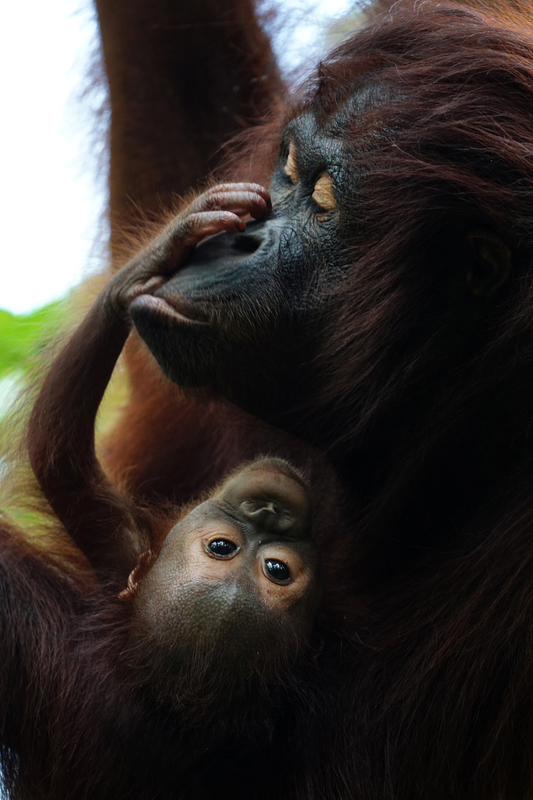 Similar to human mothers, orangutan mothers also have major roles as protector, educator, and comforter. Caretakers play an important role in the orangutan rehabilitation and reintroduction program. They act as surrogate mothers who care for and educate the orphaned orangutans in the forest school. 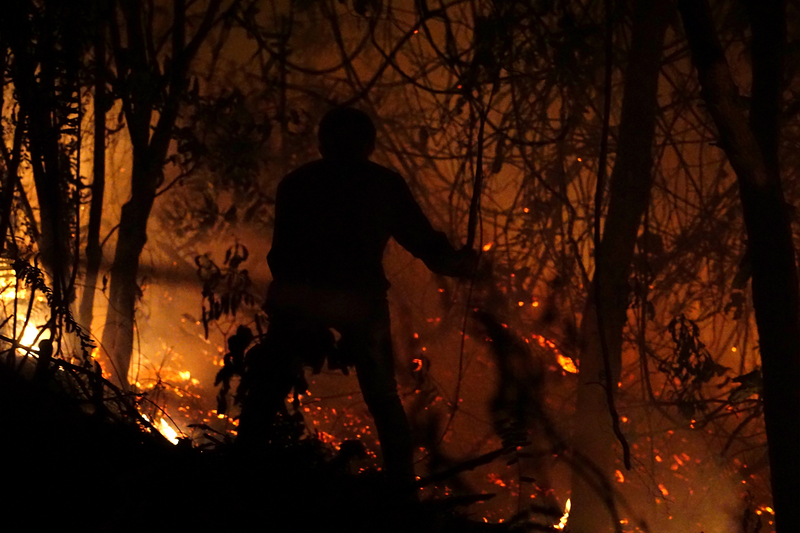 An orangutan keeper stands in the middle of flames as he tries to extinguish a forest fire in the orangutan sanctuary. 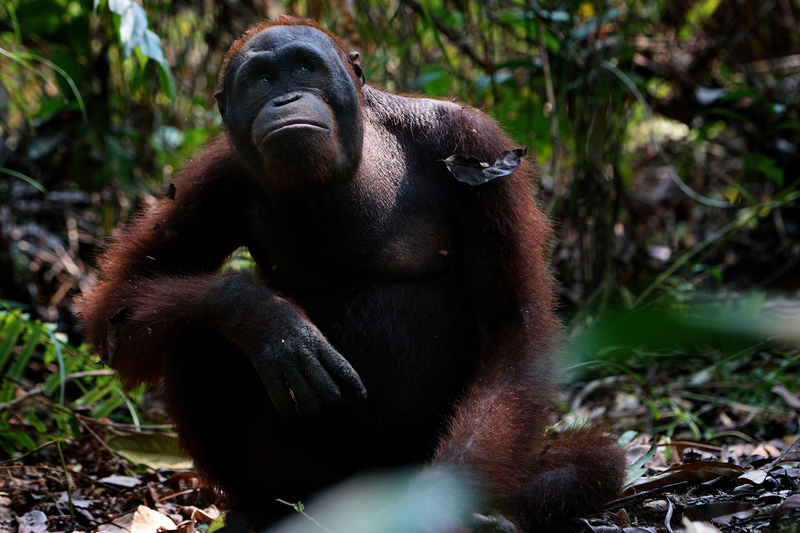 From 2009-2013, orangutans lost 4.6 million hectares of habitat. 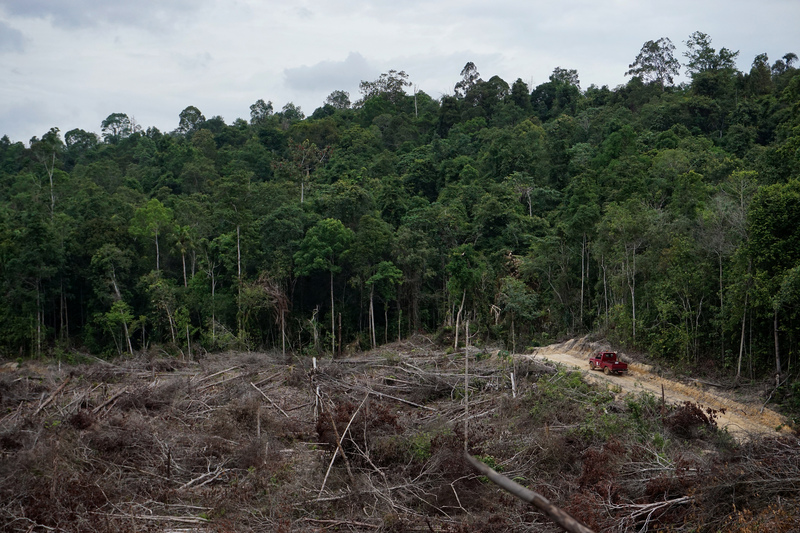 Deforestation is the major threat to orangutan habitats in the tropical rainforest. Deforestation of the rainforest is considered to be a major contributing factors to the loss of biodiversity and global climate change. In Sumatra, animism lingers alongside Islam. That combination could be wildlife's best chance for survival.